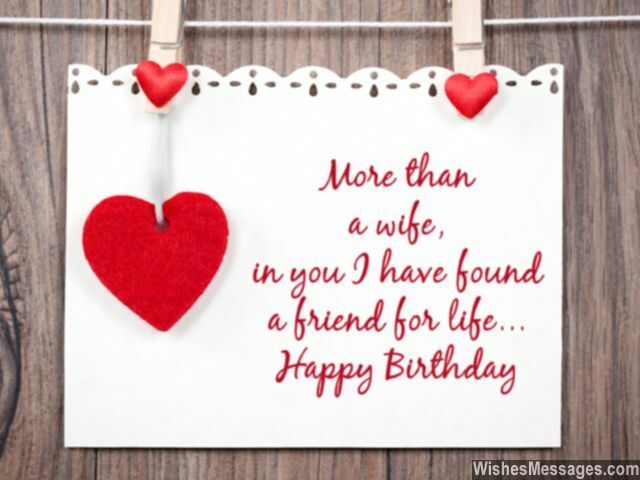 Birthday Wishes for Wife: Thinking about what to write in a greeting for your wife? Take ideas from these romantic wishes to write something of your own. The easiest way to come up with something that she will remember for a long time is to bare your feelings. Think of all the sweet memories and reminisce about how your relationship was drenched in love’s hues when you started dating. Jot it down on a handmade card or a cute little note and place it on her bedside table. Wish her a Happy Birthday in the morning with a hug. Follow it up by telling her how much you love her with a kiss. Make her the social media queen for a day by tagging her in birthday wishes all over Facebook, Twitter, Instagram and Pinterest. Take her out on a date and make sure you don’t cheap out on her gift. By the end of the day, she will be pretty convinced that she has the best husband ever. 1) More than a wife, in you I have found a friend for life. Happy birthday. 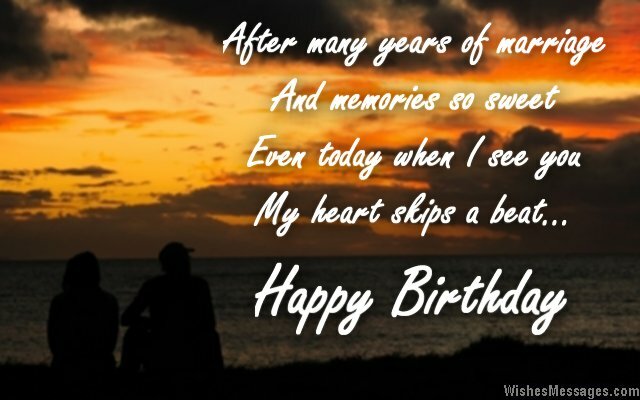 2) On your birthday I want to make a promise that I will not tire, until I fulfill all your wishes and desires. Happy birthday. 3) Good times become better and bad times become tolerable when shared with a life partner like you. Happy birthday. 4) Happy birthday to the perfect wife who has made me the perfect husband that I am today. 5) Although I am blinded by your love, it has opened my eyes to a better future. Happy birthday. 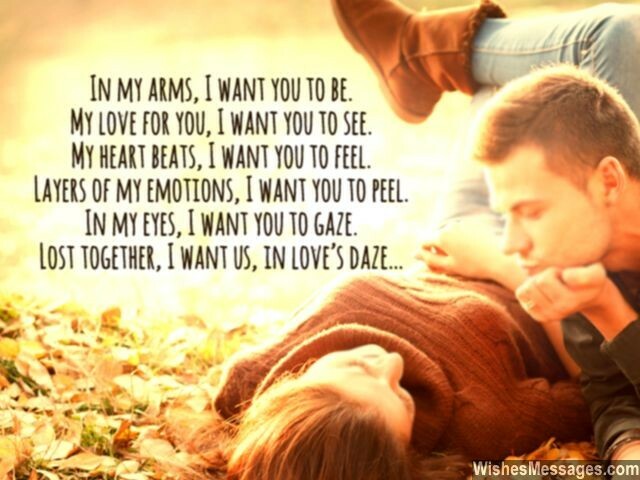 6) In my arms, I want you to be. My love for you, I want you to see. My heart beats, I want you to feel. Layers of my emotions, I want you to peel. In my eyes, I want you to gaze. Lost together, I want us, in love’s daze. Happy birthday. 7) Most people read quotes to find the true meaning of life, but all I need to do is to look into your eyes. Happy birthday. 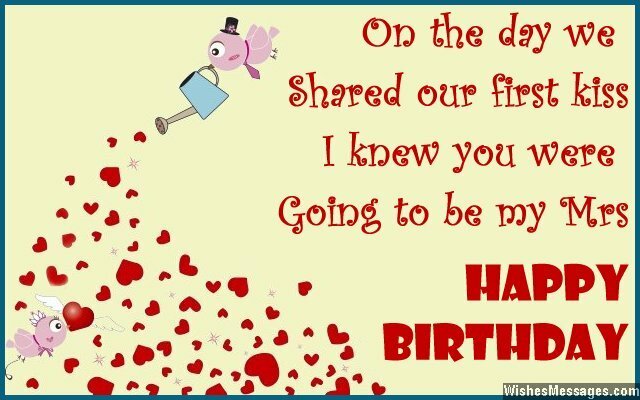 8) Your birthday is a sweet reminder that our relationship is all about looking into the years that lie ahead. The past has never mattered, and never will. Happy birthday. 10) There is so much to like about you baby, complimenting you would take longer than infinity. You are the woman of my fantasy, and I can’t imagine my life without you baby. Happy birthday. 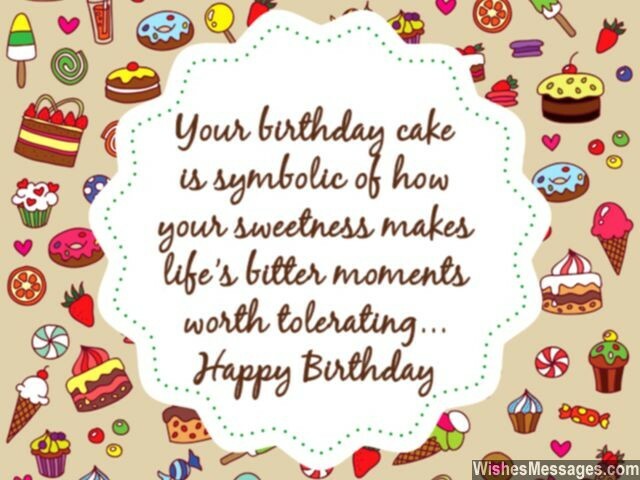 11) Your birthday cake is symbolic of how your sweetness makes life’s bitter moments worth tolerating. Happy birthday. 12) The best part of our relationship is that the memories of bitter fights have been overshadowed by those of making up after. Happy birthday. 13) I amassed a massive debt on the day I got married to you – the debt of unconditional love and undying commitment. I promise to keep repaying this debt until my very last breath. I love you, happy birthday. 15) Good times or bad, happy or sad… just one look into your eyes is all it takes to make me smile. Happy birthday. 17) It seems that everyone knows you turned a year older except me. In my eyes you are exactly the way that you were when I met you for the first time – stunning and gorgeous. Happy birthday. 18) As you blow the candles on your birthday cake, I want to tell you what a wonderful wife you make. Without you in my life, my heart would have bled. With you, I look forward to a wonderful life ahead. Happy birthday darling. 19) I didn’t know what to get for you on your birthday since I figured that diamonds would be too cheap and gold too common, when compared to a jewel like you. Happy birthday sweetie. 20) Before I met you, my life was a walk in the park – lazy and boring. After I met you, life became a spacewalk – awesome and simply out of this world. Happy birthday. 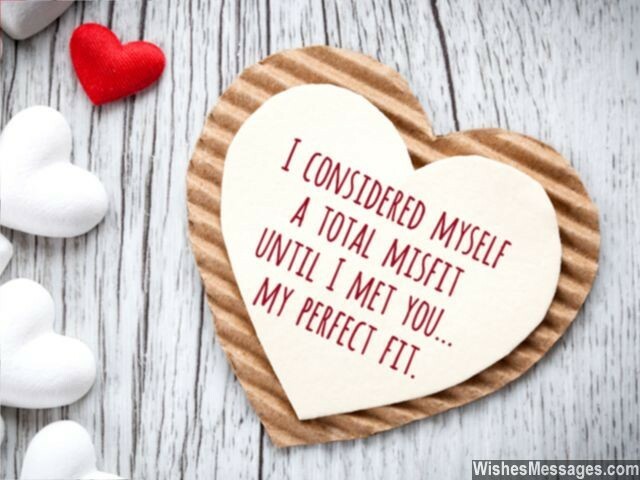 21) I considered myself a total misfit until I met you – my life partner and my perfect fit. Happy birthday. 22) If you really want to understand how much your birthday means for me, just listen to my heart after you blow the candles on your cake. It won’t be beating, it’ll be singing… Happy Birthday To You. 23) I don’t feel embarrassed in telling all my friends that you are in charge of my life. I feel lucky and proud to have a woman as hardworking and focused like you, as my wife. Happy birthday. 24) Your birthday is the perfect opportunity to say SORRY for all the fights and arguments, THANK YOU for all the sacrifices you’ve made and I LOVE YOU for everything that you mean to me. Happy birthday. 25) You are my life’s healing tonic. Without you, everything would be completely toxic. The rock solid support of a wife like you, is available only to a lucky few. Happy birthday. 26) On the day we shared our first kiss, I knew you were going to be my Mrs. Happy birthday darling. 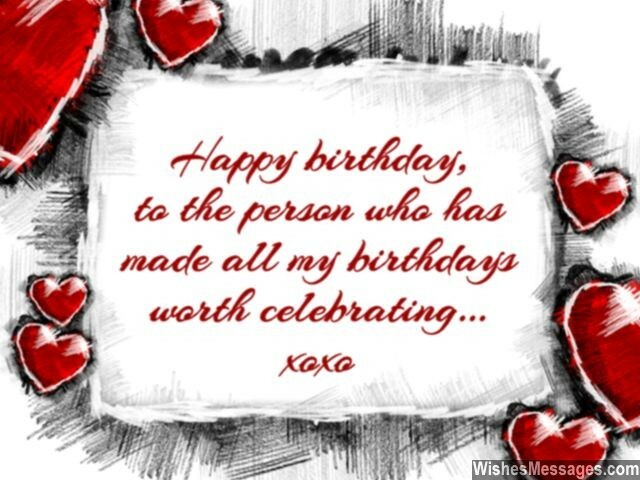 27) As you blow the candles on your cake, please don’t make any wishes for me. In you, I’ve already got everything I could have ever wished for. Happy birthday. 28) On your finger the day I slid that ring, you made me fly by giving me wings. As radiant as the sun’s beams, you have always been the girl of my dreams. Happy birthday. 29) With you as my wife and the mother of my children, I wouldn’t have life any other way. My lifelong promise towards our marriage and family, is what I ceremonially renew again on your birthday. 30) You came, you saw and you conquered the rest of my life. I love you, happy birthday. 31) After many years of marriage and memories so sweet, even today when I see you my heart skips a beat. Happy birthday honey. 32) Heaps of years have gone by since the day we got married, but you still look as beautiful as the moment I saw you walking down the aisle. Happy birthday. 33) As the Queen of this home prepares to blow the candles on her cake, we all get together to thank her for all the sacrifices she makes. Happy birthday. 34) A birthday is incomplete without a toast, and here’s mine for you – As a mother, you’re the sweetest. As a woman, you’re the prettiest. As a wife, you’re the best. Happy birthday. 35) Even after all these years, every moment I am away from you, makes my heart feel dull and blue. Happy birthday. 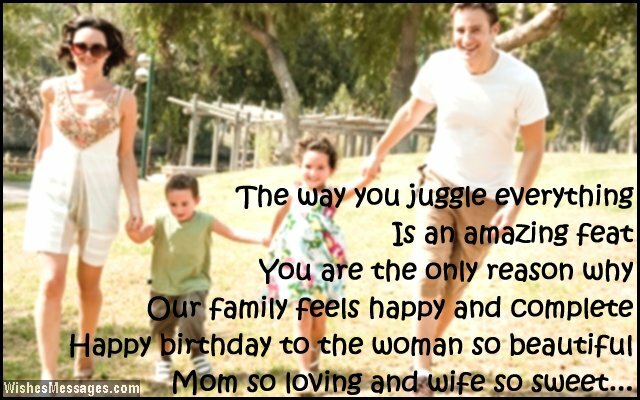 36) The way you juggle everything is an amazing feat. You are the only reason why our family feels happy and complete. Happy birthday to the woman so beautiful, mom so loving and wife so sweet. 37) Your birthday party will whizz by in a jiffy, but I promise that the celebration of our love will last forever. Happy birthday. 39) I am not going to take any selfies with you, because age hasn’t touched you and I don’t want to be the only one looking older. Happy birthday. 40) As long as I have you by my side there isn’t anything in the world that can stop me now. To a supportive wife and a beautiful life partner like you, I take a bow. Happy birthday.